Lactose and sucrose are both carbohydrates, which is one of the classes of macronutrient compounds. Humans require macronutrients -- carbohydrates, proteins, and fats -- in relatively large quantities, because they provide cells with energy. Chemically, there are many similarities between lactose and sucrose, although they're digested through different mechanisms by the body. Sucrose is a disaccharide, meaning that it's made up of two smaller sugar units, called monosaccharides, that are chemically bonded together. In their book "Biochemistry," Drs. Reginald Garrett and Charles Grisham explain that sucrose consists of a glucose and a fructose ring chemically linked together. Sucrose is more commonly called "table sugar," and has the chemical formula C12H22O11. In the digestive tract, enzymes separate the glucose from the fructose ring, and the intestine absorbs them separately. Like sucrose, lactose is also a disaccharide, note Drs. Garrett and Grisham. It consists of a glucose ring chemically bonded to another monosaccharide called galactose. 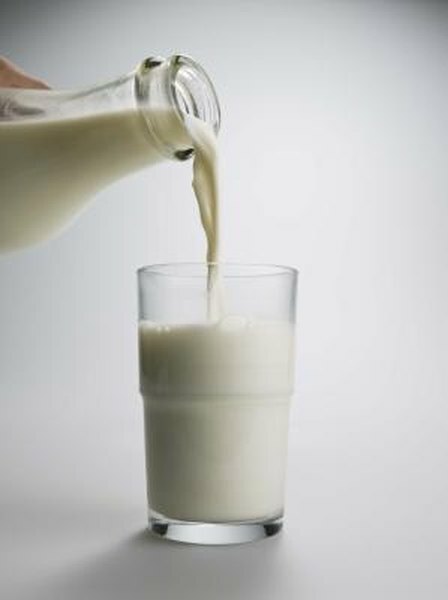 The most common dietary source of lactose is milk -- lactose is often called "milk sugar," in fact. Also like sucrose, lactose has the chemical formula C12H22O11, but because lactose contains a galactose ring instead of a fructose ring, the arrangement of atoms in the sugar is different from that in sucrose. Both lactose and sucrose taste at least somewhat sweet to humans, note Drs. Mary Campbell and Shawn Farrell in their book "Biochemistry." Sucrose, however, is much sweeter than lactose, because it binds much more tightly to sweetness receptors on the tongue. Compared to sucrose, which is arbitrarily assigned a relative sweetness of 100, lactose has a sweetness of about 16, making it approximately one-sixth as sweet as sucrose. Humans can't absorb disaccharides from the intestine. Instead, when you eat disaccharide sugars like lactose and sucrose, your digestive enzymes split the sugar rings from one another, and the intestines absorb the monosaccharides individually. Different enzymes split sucrose and lactose, notes Dr. Lauralee Sherwood in her book "Human Physiology." The enzyme required to digest sucrose is called sucrase, and the enzyme responsible for digesting lactose is called lactase. It's not uncommon for humans to lack lactase, the enzyme that digests milk sugar. If you don't produce lactase, you can't digest lactose, which results in lactose intolerance. This doesn't happen frequently with sucrose -- sucrase deficiency is exceedingly rare. If you're lactose intolerant, consuming lactose-containing products results in the lactose passing undigested into your lower intestine, where intestinal bacteria then digest the sugar. This results in production of gas, leading to a bloating or cramping sensation.